Floating market is a original feature of deltas of Mainland Southeast Asia, where has thousands of rivers and canals in various sizes. 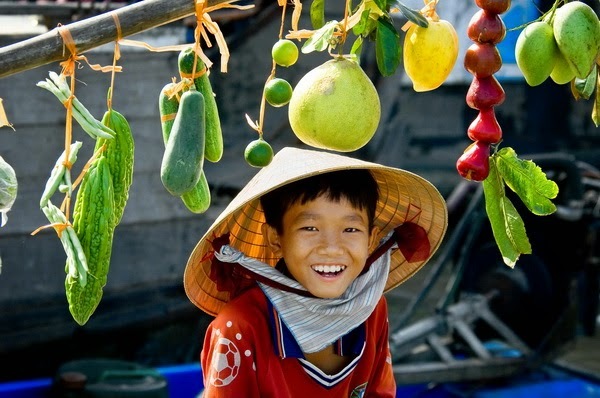 In Vietnam, floating market is a specific cultural part of the Southwest. 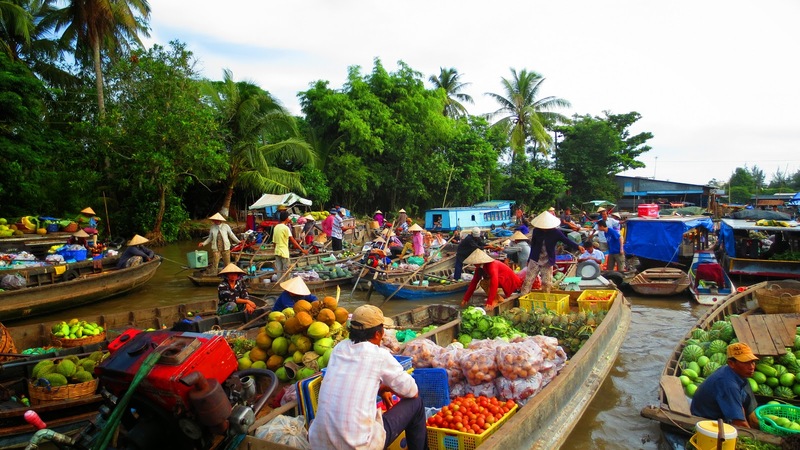 If you tend to explore Mekong delta, you should not skip a cruise to floating markets. The market is held in rivers, among a vast waterway with hundreds of boat, junk and canoe of residents. The floating market opens up a whole day, but it is usually the most bustling in the morning, when it is cool. The more it turns to noon, the hottest the weather is, the fewer customers are. So you should visit floating markets in early morning. Boats are loaded fully of goods. Fruits are the most popular kind of merchandise. The peculiar point of boats is that in each has several poles. People dangle products which they sell on these poles. 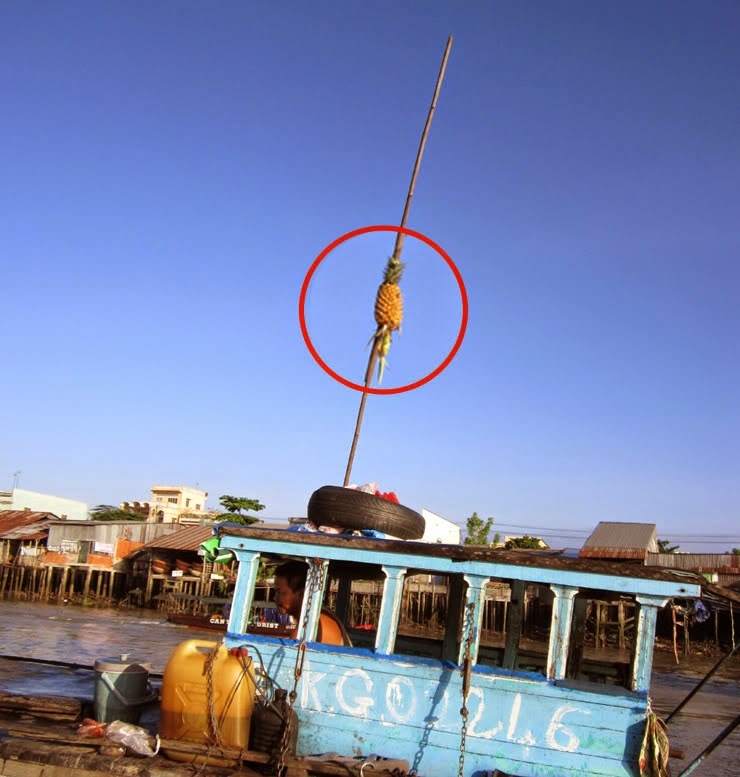 Therefore, customers just only look at the poles, they can know whether the boat has things they need or not. By this original marketing way, customers from a far distance can see clearly items. Residents hang products they sell on poles. 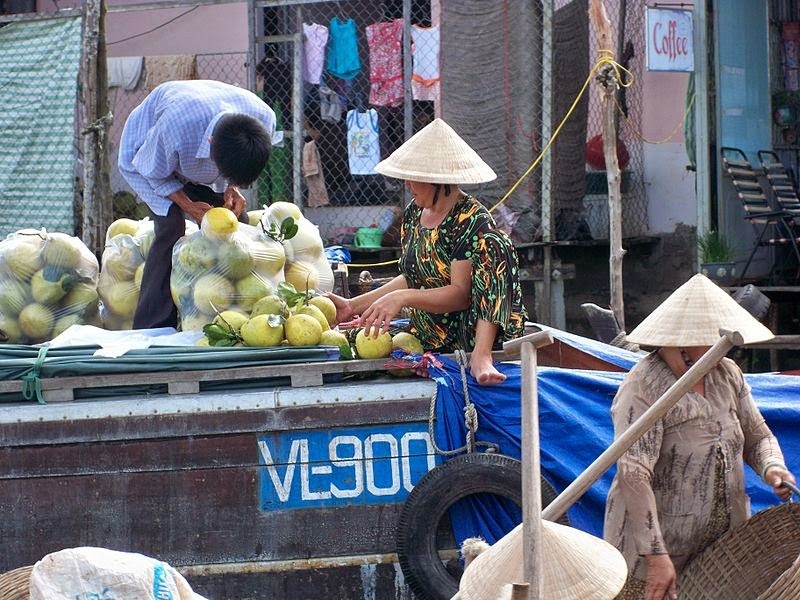 These are general characteristics of Vietnam floating markets. - Market is the place where trade and exchange actually local produce of local inhabitants, comprising agricultural products and foodstuff. - Stores or boats normally do not have any sign. Sellers hang products which they sell on poles or over prows; sell oranges hang oranges, sell mangoes hang mangoes, sell coconut hang coconut, etc. People call these poles as “cay beo”. 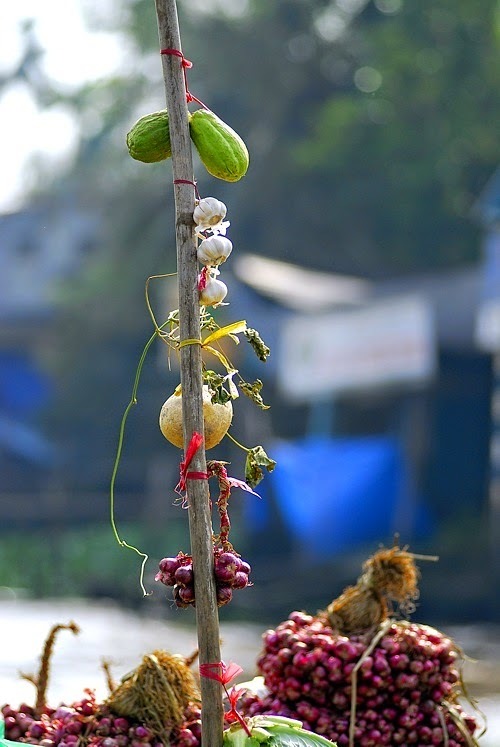 These “cay beo” are erected on prows or hang horizontally on boats. "Cay beo" is erected on the prow. - If wanting to know the area which a boat belongs to, just regard into a side of the boat, which is written a province code abbreviated by two first letters. For instance, “Tien Giang” province is written as “TG”. 1. “Hanging things which are not for sale.” They are just clothes. Residents of the floating market commonly live in boats, so their clothes are also dried in sun on boats. 2. “Things are for sale but not hung.” These boats are food or beverage stalls. That goods cannot be hung. 3. “Hang one thing but sell another thing.” If you see only a few pineapples hung on a boat, this means that the owner want to sell this boat. So, hang pineapples, but sell the boat. Some famous floating markets you can visit are Cai Be (Tien Giang province), Phung Hiep (Hau Giang province), Chau Doc (An Giang province), Can Tho and Phong Dien (Can Tho city). 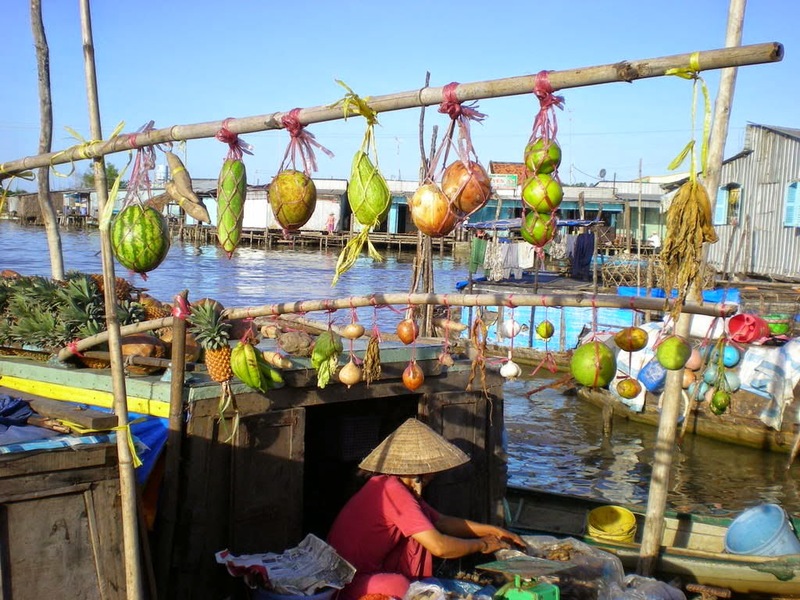 Any Mekong delta tour also set an excursion to floating markets for you. You can choose biking around Mekong countryside to discover the cultural life of local residents. Thanks for the post, this place is really a nice place to experience river life in Vietnam. Check out more at http://topmekongcruises.com/ maybe you'll find more options for travel in this period.